Ratha Jatra is being celebrated on 29 June ( today ) this year. Ratha Jatra also known as the Chariot festival or Car festival, is one of the most important festivals in Orissa and also a major tourist attraction. This festival is celebrated in honour of Lord Jaganaath who is an incarnation of Lord Vishnu. Every year in the month of Asada, the Chariots of the Lord Jaganath accompained with those of his siblings, Lord Balabhadra & Goddess Subhadra roll from Srimandira to Gundicha temple, the abode of his Mausi maa ( Mother's sister ). The sight of the sea of humanity which follows the Gods during this journey is a truely overwhelming experience. Darpadalan - Lord subhadra's chariot. Chera pahanra - the chariots of the Lords are swept by the incumbent King of Puri with a broom which has a few gold strands in it. The chariots are pulled by the eager followers who believe it be aspicious. The journey takes about midday to evening. In case the Lords are not able to complete the journey on the same day, they resume the remaining jouney on the next day. 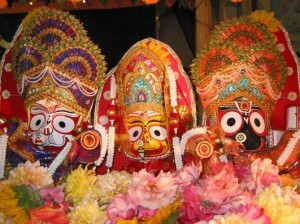 The Lords stay at Gundicha temple for 7 days and return to Shri mandira in a similar procession which is called the Bahuda or Ulta Ratha Jatra. During their stay at the Mausi Maa Mandira, various edibles are offered to the Lords as prasad. SOme of them are Khaee, Khira Kadali, Gajja, Pheni, Poda pitha, Manda pitha, Enduri pitha, Arissa pitha and Karaka pitha. Ratha jatra is also celebrated at the ISKON temples and by the oriya community settled in various parts of India and abroad. Catch the live action in Hyderabad @ Jaganath Temple, Banjara Hills or @ ISKON temple, Secundrabad. Bangalore folks head over to the Jaganaath Temple in Agara. Nice post. Thanks for writing about Jagannath Puri rath Yatra, Puri. 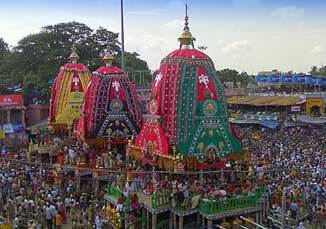 Puri is part of the Char Dham pilgrimages and also one of the 7 holy Indian cities. Click here to know about hotels in Puri offering comfortable accommodation in decent prices.